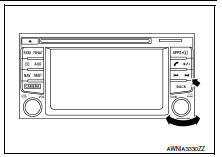 Refer to OwnerвЂ™s Manual for navigation and audio system operating instructions. Audio function and display are built into AV control unit. This navigation has the following functions. iPodВ® is a trademark of Apple inc., registered in the U.S. and other countries. The navigation system can be operated by control panel of the AV control unit and display (touch panel) of the AV control unit. 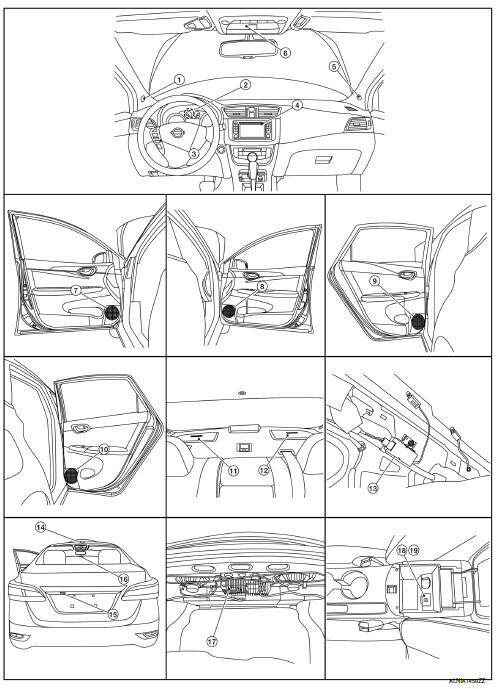 Guide sound during the operation of the navigation system is output from AV control unit to front tweeters. AV control unit calculates the vehicle location based on the signals from GYRO (angle speed sensor), vehicle sensor, and GPS satellite, as well as the map data from map SD-card. The vehicle location is displayed on the AV control unit. The current position of the vehicle is then identified by comparing the calculated vehicle position with map data read from the map SD-card (map-matching), and indicated on the screen as a vehicle mark. More accurate data is judged and used by comparing vehicle position detection results found by the GPS with the result by map-matching. The current vehicle position will be calculated by detecting the distance the vehicle moved from the previous calculation point and its direction. Travel distance calculations are based on the vehicle speed sensor input signal. Therefore, the calculation may become incorrect as the tires wear down. To prevent this, an automatic distance correction function has been adopted. Change in the travel direction of the vehicle is calculated by a gyroscope (angular velocity sensor) and a GPS antenna (GPS information). They have both advantages and disadvantages. More accurate traveling direction is detected because priorities are set for the signals from these two devices according to the situation. Map-matching compares a current location detected by the method in the вЂњLocation Detection PrincipleвЂќ with a road map data from map SD-card. The road map data is based on data stored in the map SD-card. The vehicle position may not be corrected under the following circumstances and after driving for a certain time when GPS information is difficult to receive. In this case, the vehicle mark on the display must be corrected manually. In map-matching, alternative routes to reach the destination will be shown and prioritized, after the road on which the vehicle is currently driven has been judged and the vehicle mark has been repositioned. Alternative routes will be shown in different order of priority, and the incorrect road can be avoided if there is an error in distance and/or direction. Routes are of the same priority if two roads are running in parallel. Therefore, the vehicle mark may appear on either of them alternately, depending on maneuvering of the steering wheel and configuration of the road. Map-matching does not function correctly when a road on which the vehicle is driving is new and not recorded in the map SD-card, or when road pattern stored in the map data and the actual road pattern are different due to repair. The map-matching function may find another road and position the vehicle mark on it when driving on a road not present in the map. Then, the vehicle mark may change to it when the correct road is detected. Effective range for comparing the vehicle position and travel direction calculated by the distance and direction with the road data read from the map SD-card is limited. Therefore, correction by map-matching is not possible when there is an excessive gap between current vehicle position and the position on the map. GPS (Global Positioning System) is developed for and is controlled by the US Department of Defense. The system utilizes GPS satellites (NAVSTAR), transmitting out radio waves while flying on an orbit around the earth at an altitude of approximately 21,000 km (13,049 mile). The receiver calculates the travel position in three dimensions (latitude/ longitude/altitude) according to the time lag of the radio waves that four or more GPS satellites transmit (three-dimensional positioning). The GPS receiver calculates the travel position in two dimensions (latitude/longitude) with the previous altitude data if the GPS receiver receives only three radio waves (two-dimensional positioning). GPS position correction is not performed while stopping the vehicle. In two-dimensional positioning, GPS accuracy will deteriorate when altitude of the vehicle position changes. The position of GPS satellite affects GPS detection precision. The position detection may not be precisely performed. The position detection is not performed if GPS receiver does not receive radio waves from GPS satellites. (Inside a tunnel, parking in a building, under an elevated highway etc.) GPS receiver may not receive radio waves from GPS satellites if any object is placed on the GPS antenna. The detection result has an error of approximately 10 m (32.81 ft) even with a high-precision three dimensional positioning. There may be cases when the accuracy is lowered and radio waves are stopped intentionally because the GPS satellite signal is controlled by the US trace control center. Satellite radio function is built into AV control unit. Sound signal (satellite radio) is received by satellite antenna and transmitted to AV control unit. AV control unit outputs sound signal to each speaker. Sound can be output from an external device by connecting a device with USB connector and AUX jack. AUX sound signals are transmitted to each speaker via AV control unit. The AV control unit supplies power to the rear view camera when receiving a reverse signal. The rear view camera transmits camera images to the AV control unit when power is supplied from the AV control unit. The AV control unit combines a warning message and fixed guide lines with an image received from the rear view camera to display a rear view camera image on the screen. iPodВ® or music files in USB memory can be played. Sound signals are transmitted from USB connector and AUX jack to the AV control unit and output to each speaker and tweeter. iPodВ® is recharged when connected to USB connector and AUX jack. Use the enclosed USB harness when connecting iPodВ® to USB connector and AUX jack. Volume level of this system goes up and down automatically in proportion to the vehicle speed. BluetoothВ® control is built into AV control unit. 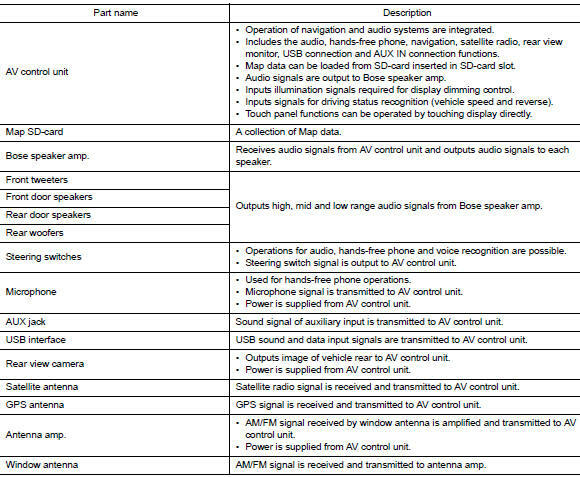 The connection between cellular phone and AV control unit is performed with BluetoothВ® communication. The voice guidance signal is input from the AV control unit and output to the front tweeters when operating the cellular phone. Spoken voice sound output from the microphone (microphone signal) is input to AV control unit. AV control unit outputs to cellular phone with BluetoothВ® communication as a TEL voice signal. Voice sound is then heard at the other party. Voice sound is input to own cellular phone from the other party. TEL voice signal is input to AV control unit by establishing BluetoothВ® communication from cellular phone, and the signal is output to front tweeters. Perform CONSULT diagnosis if the AV control unit on board diagnosis does not start or the screen does not display anything. While pressing the FORWARD SEEK button, turn the TUNEdial counterclockwise 3 or more clicks, then clockwise 3 or more clicks, then counterclockwise 3 or more clicks. Shifting from current screen to previous screen is performed by pressing BACK button. 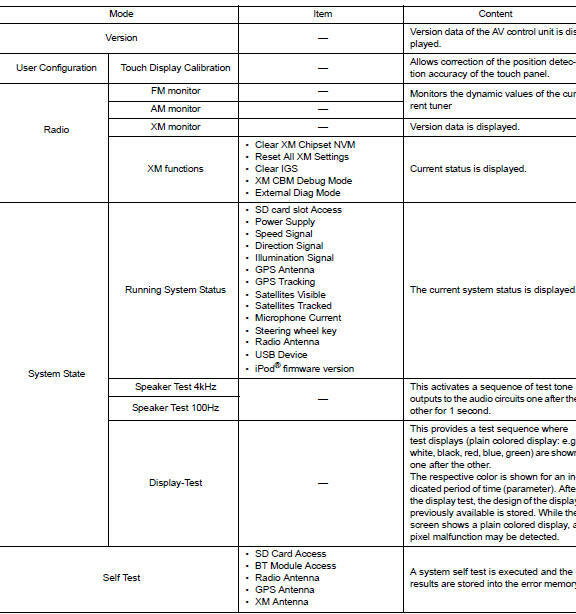 The trouble diagnosis initial screen is displayed, and Version, User Config, Radio, System State or Self Test can be selected. CONSULT performs the following functions via communication with the AV control unit. The part number of AV control unit is displayed. Refer to AV-233, "DTC Index". 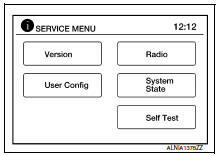 Refer to AV-251, "CONFIGURATION (AV CONTROL UNIT) : Description".